1. gum and candy. Who was the most popular kid in school and on the bus? The kid selling a piece of bubble gum for a quarter! Remember that rip off? I bet that is how Donald Trump got his start. Seriously, the little entrepreneur selling gum and candy out of his back pack...super-genius! I say his because it always seemed to be a boy and never a girl. I hope there are more girls selling gum at school now than in my day! And why should an adult have gum and candy in their briefcase? To manipulate the boss and coworkers of course! Sugar the boss up real good then go ahead and ask for whatever you want! Sugar your coworkers up real good and then ask them to finish your monthly reports for you! And, when you get caught napping in the afternoon, you can say, "I must have low blood sugar, I'm so sorry, let me get a kit kat out of my briefcase and I'll be better in a minute, thanks for being so understanding of my medical issues!" 2. paper clips. Unbend a paper clip and it can potentially get you out of any locked environment. It is the perfect lock picker! And, paper clips are good for cleaning under your nails so the teacher thinks you washed your hands. You need paper clips in your briefcase too! 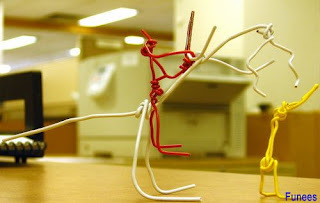 If you take a hand full of paper clips, you can unbend and bend them into all kinds of different things...including a mini voodoo doll of the boss. That's right, bend some clips into the boss's likeness and drop it on the floor, step on it, spill hot coffee on it...go ahead...you know you want to! It is the safe alternative when you need to get your feelings out. 3. A calculator. So you can get your assignments done within minutes as opposed to using that number line you still have from first grade. And you need a calculator in the briefcase...especially on pay day, so you can figure out how much your check is short, cause you know it's going to happen. Remember when you worked through your unpaid lunch half hour monday-tuesday-wednesday-thursday-friday? Yeah....they didn't pay you for that last week or this week. 4. A sharpie. You need to label all your stuff permanently. Bottom line...little kids steal and coworkers steal. Those little kids will dig right into each others back packs and take stuff! As for coworkers...you know how it feels when you bring your lunch and put it in the community fridge and then come lunch time your food is gone! Or your favorite clipboard that you bring to meetings...stolen! Label it all with the sharpie, so when you go to your next meeting and you see someone with a clipboard, you can politely ask to look at it and then say..."Ah-ha! that's my clipboard! See my name right there on it in permanent ink? Give it back or I'm telling!"